People SPECIALIZE when they produce only some of the goods and services they consume, then trade with others to get more of the things they want. 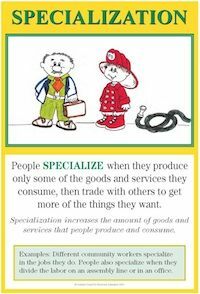 Specialization increases the amount of goods and services that people produce and consume. Examples: Different community workers specialize in the jobs they do. People also specialize when they divide the labor on an assembly line or in an office. Draw and label a picture of a good or service you want to produce when you grow up. Write a sentence telling why you made that choice. Take a "walking tour" through the school, noting all the special jobs that people do. Then create a "School Specialization Book," complete with drawings, pictures, and examples of specialization. Students should note how specialization leads to interdependence. Mount pictures from newspapers and magazines showing community workers doing special jobs to earn income. Write a paragraph explaining why people specialize in different jobs. Have a "Community Resource Day," inviting community people to come and share about their jobs. Emphasize the education and training needed for these jobs. Draw a picture of workers dividing the labor on an assembly line or in an office. Identify the skills needed for each task. Discuss how dividing the labor usually results in lower production costs. Identify three jobs. For each job list the special skills, education, and training needed for the job. Write a paragraph describing how workers acquire these skills. Make a classroom product using an assembly line. Compare the accuracy and speed of production with that of making the products individually. On a black line world map, show/draw goods produced by different countries. Write a paragraph entitled, "Why Countries Specialize in the Goods and Services They Produce," or "Why Specialization and Trade Make Countries Interdependent." Lesson 8: Specialization - Have students make hamburgers on an assembly line.